What’s New on The 2018 Chevy Traverse? When you’re looking for a larger family-sized vehicle, size and fuel economy are probably some of the first things that come to mind. Often times, it’s incredibly difficult to satisfy both of these criteria, and car buyers have to sacrifice one of these aspects for the other. 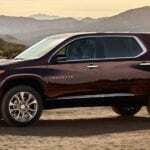 But, with the new 2018 Chevy Traverse, the Chevrolet brand seems have done just that and more. The new model by Chevrolet has really upped their game this year – engineering a car with increased fuel economy, more leg room, and some impressive new safety and spec features. Through sheer engineering prowess Chevrolet has produced a car that will satisfy everyone’s requirements and then some. Take a look at the 2018 Chevy Traverse and experience some of the new and improved features this model has to offer. No one likes to be squished in the back of the vehicle during a long road trip. The engineers at Chevrolet know this for a fact and have manufactured the new 2018 Chevy Traverse with a more spacious interior. The car comfortably seats eight people and has an amazing 33.7 inches of legroom in the third row of seats – a row usually meant for smaller children who can occupy smaller spaces. The third row, second row, and, of course, the driver and passenger seat, have plenty of spreading-out room in the 2018 Chevy Traverse. You won’t be knocking elbows with your neighbor hoping to get a little more space in this car, you’ll be relaxed, comfortable, and ready for a long ride with plenty of room. With all that extra leg room, wouldn’t there be less room for cargo and trunk space? Not with the Chevy Traverse 2018. With the back row of seats folded down, the Chevy Traverse has the cargo room of an astonishing 98.2 cubic feet. If that’s not enough, there is a hidden underfoot rear storage compartment that’ll hold any extra cargo you might have. If superior cargo space is your priority, this may be the best new vehicle for you. The 2018 Chevy Traverse received a National Highway Traffic Safety Administration score of five out of five for safety – and with its new array of safety features, you can see why. The vehicle possesses the latest in modern safety features with front end and back end safety technology. The front end of the vehicle is stacked with Forward Collision Alert, Front Pedestrian Braking – which will automatically brake for you if a pedestrian is detected and you haven’t already braked, Lane Keep Assist with Lane Departure Warning – which gently steers you back into your lane if lane drifting is detected, and Forward Automatic Braking. When your family is in the vehicle, or a teen is driving, you can rest easy knowing that this car will keep you and your family safe, even if the driver’s attention has drifted. The back end of the vehicle features numerous safety and technology features. These features include rear vision camera, rear cross traffic alert – which utilizes radar senses to notify the driver to traffic approaching behind the vehicle, side blind zone alert, and rear park assist – which uses ultrasonic sensors, and guides you into the parking space through guided lines portrayed on the rear camera. With these safety standards, it’s going to be hard to find another car that’ll be able to have the alert, steering, and surround vision capabilities that will keep you as safe as the 2018 Chevy Traverse. If high tech technology is a must for you and your vehicle, then you can’t go wrong with the 2018 Chevy Traverse. The vehicle has a built-in Wi-Fi hotspot so you will never be without access to the internet or GPS, as well as a 7-inch dashboard touch screen that includes Apple CarPlay and Android Smartphone mirroring. The vehicle also has Teen Driver Technology which offers a number of advanced features. The car audio can be automatically muted until the driver and the passenger have buckled themselves in. In addition, available advanced safety features are automatically turned on, like the forward collision alert and forward collision braking to ensure that your teen and any passengers are safe. Finally, Teen Driver Technology also includes an in-vehicle report card that can help identify problem areas in your teens driving that could use more coaching and improvement. The 2018 Chevy Traverse has a 9-speed transmission which can improve fuel economy by 4 mpg. The vehicle gets 27 mpg on the highway and has a fuel tank capacity of 19.4 gallons. These are better specs than other large size SUVs and offers an improved budget for you and your family. If you’re interested in a larger vehicle that has some power behind it, than buyers will be happy to note that the new model has 310 hp at 6800 rpm and 266 lb-ft of torque at 2800 rpm. The vehicle has a V6 gas engine and front wheel drive, and a trailering capacity of up to 1500 lbs. If you’re interested in having a variety of options, then look no further. The 2018 Chevrolet Traverse has a number of different models – the LS, LT, RS, Premier, Redline, and High Country. The LS, LT, and RS are the standard models on offer that includes chrome accents and black roof rails. The Premier, Redline, and High Country are the models that come with a number of benefits, such as a luxury interior and the High Country comes equipped with every safety and convenience feature. 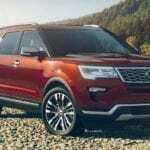 These models redefine what ’s considered high standard in the large SUV vehicle market. 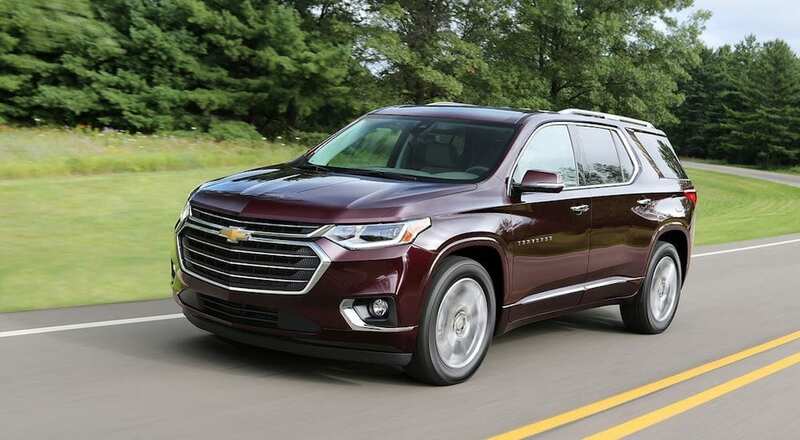 Named as one of ‘The Ten Best Cars of 2018’ by Parents and Edmunds, the 2018 Chevrolet Traverse is a hard vehicle to beat. With its sleek exterior and superior safety and vehicle features, this is one of the best family cars on the market now. Whatever you may require for your vehicle needs, check out the 2018 Chevrolet Traverse – it’ll take you where you need to go.